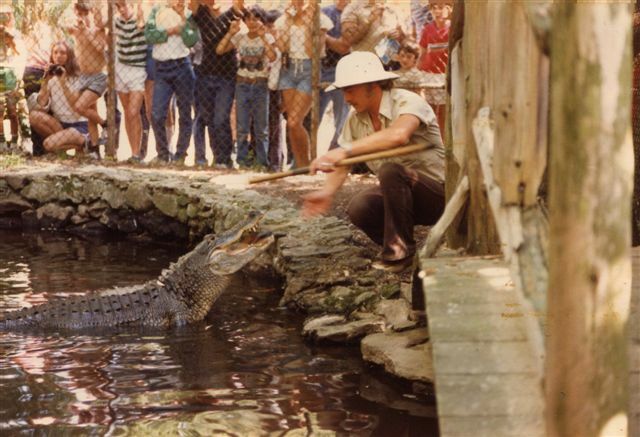 These images of Benson's Animal Park were submitted by Bret Bronson. 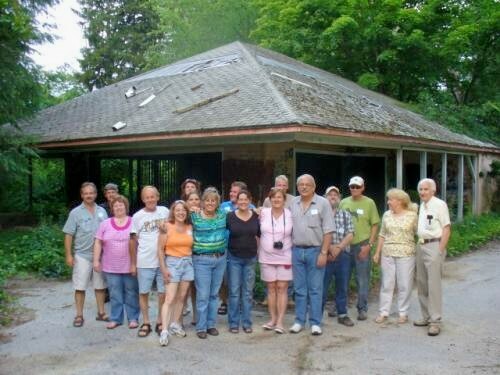 Jun 27, 2009 - Part of the Benson's Reunion Group taken in front the former Gorilla House. (l.to r.): Front row: Kathy (Weldon) Mills, Rachel (Comtois) Feeley, Cindy Provencher, Cathy & Jay Knox; 2nd row: Bret Bronson, Chick Forrence, Rhonda (Perry) Knowlton, Cathy Provencher, Bruce Ashmore, Jodi Provencher, Gary Provencher, Tim Dutton, Steve Klein, Kevin Houle, Catherin Kenney, Arthur Provencher. Myself [Bret Bronson] and Randy Warren taken in early '80's. 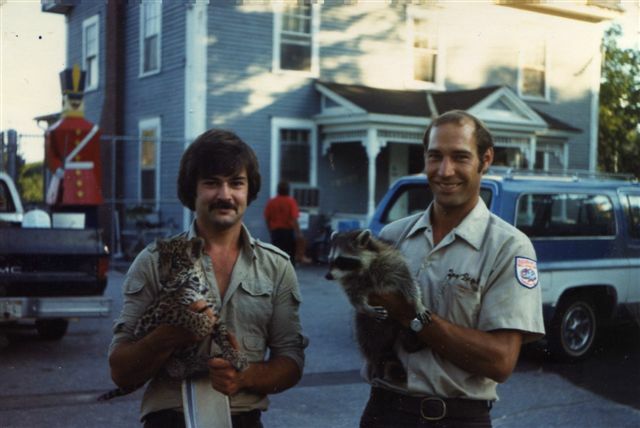 Me with jaguar cub and Randy with raccoon. 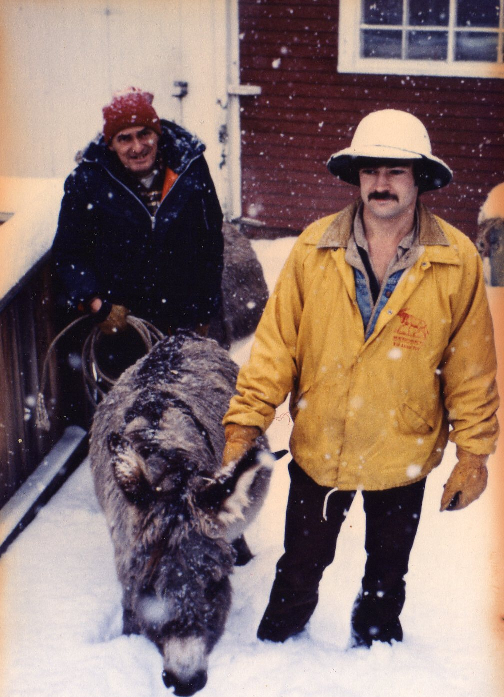 We just learned that Randy passed away this past year in Maine. Old Bensons bumper sticker (not sure of era) Bruce Ashmore had me scan to submit for the site. 'Queen' - who passed away this past spring. Photo was taken in 1981, last year she performed this feat. 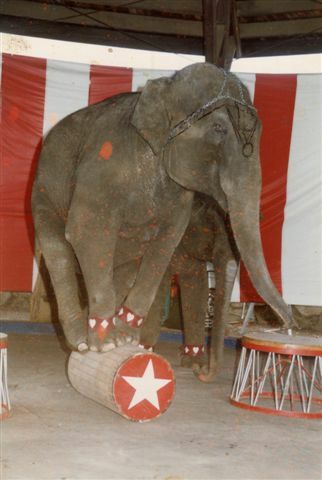 She was one of a small handful of elephants to ever be trained to roll a barrel. She was originally trained by Slivers Madison in the early '60's. 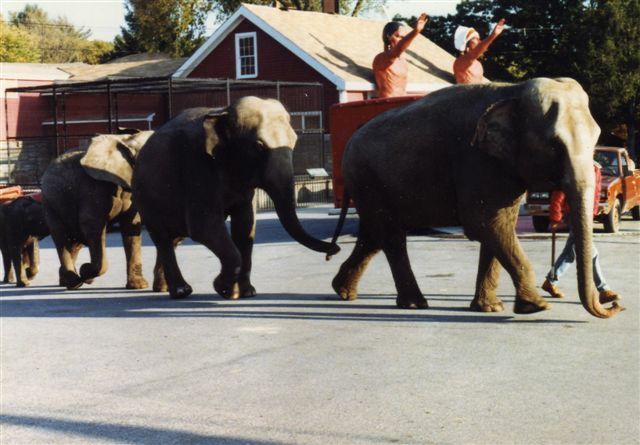 Last 4 Benson's elephants, 'Liz', 'Queen', 'Jackie', and 'Tanya' going for a walk thru park to old 'lumber yard' at far end of zoo for 'playtime'. Elephant Barn in background. 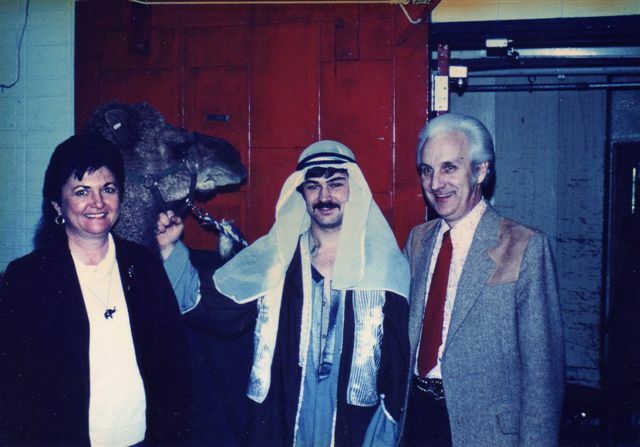 Photo taken in October 1987, week prior to final auction. 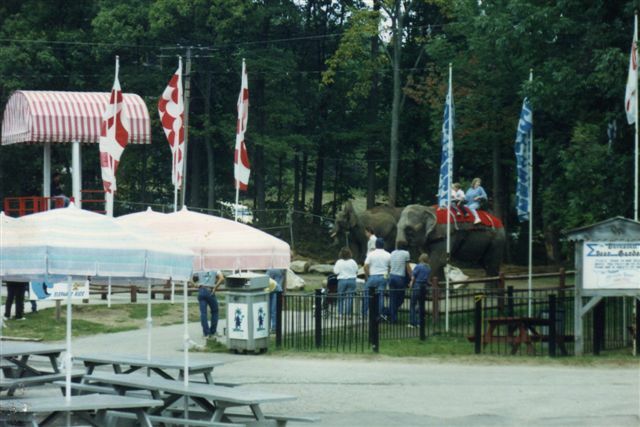 Elephant ride area in Sept. 1987. 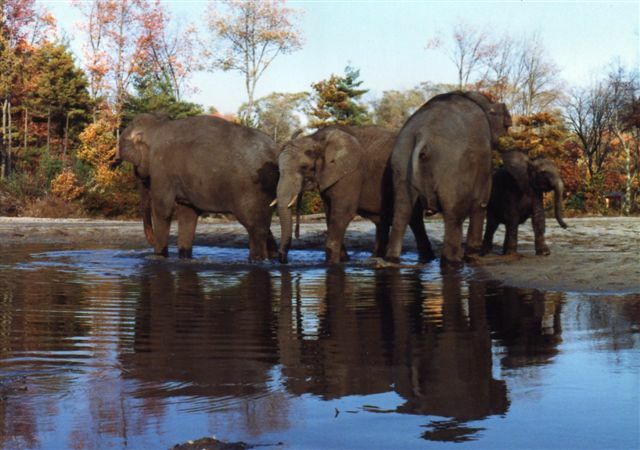 Located behind elephant barn, at corner of Kimball Hill Road and Bush Hill Road. 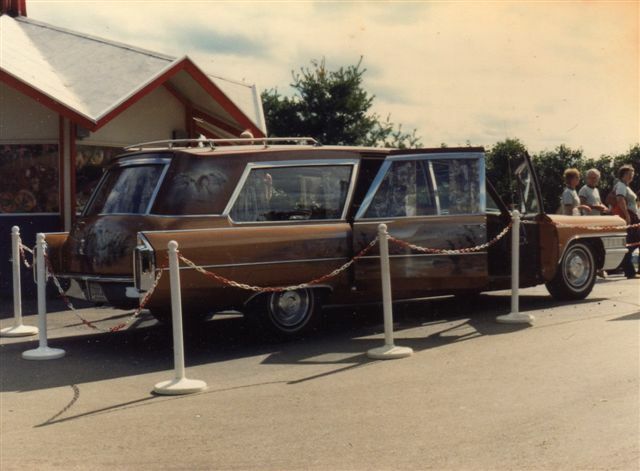 This photo shows the infamous Harvey, noted by a couple of recent Bensons' website visitors and fondly known to anyone likely that worked at the park during his 'era'. Here's thinking of you Harvey! I'm not really sure how long Harvey was employed at Bensons. 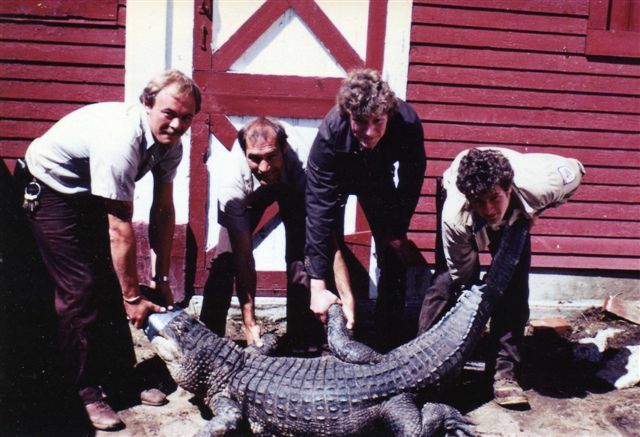 He was there when I arrived in early '80 and left sometime around '83. He was a gruff fairly 'unkept' individual - to say the least but, he was a very unique and intelligent guy. Those that knew him will get a big smile I'm sure in seeing his photo. Harvey was truly a unique 'Bensons Individual'. I did hear he passed away several years ago though, I'm not sure where or when.